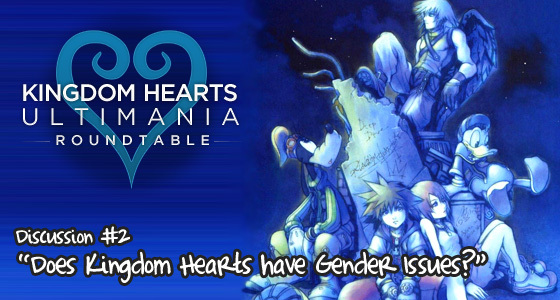 In this article, we continue our discussion on gender issues in Kingdom Hearts. Returning for the roundtable discussion are: Jackie; Shay, one of our global moderators; Hannah, is also a staff member at Kingdom Hearts Ultimania; from Monstervine.com, DizuniinoMahou, Nintendo editor from Monstervine.com; and Francis, copy editor from Monstervine.com. In Part 1, roundtable discussion revolved around the Disney side of Kingdom Hearts, and its effect on the representation of women and the roles offered for them. Kairi also took a spotlight, with some disagreement on her amount of importance. Overall, the panel agreed that Kingdom Hearts has improved its representation of women with every title released. Other topics include: Riku and Sora, both of whom could be argued as male stereotypes; the fact that a game’s design with one leading character necessarily reduces women to damsels in distress (women can’t save themselves, otherwise the player would have nothing to do! ); and Aqua, the series’ first playable female character. Now, let’s continue the discussion! Jackie: Can we talk about Xion a little bit? First, I think we have to clarify the story around Xion: she’s not a Nobody, in the strict sense that she’s a replica of Roxas, created to act as a fail-safe for the Organization in case both Roxas and Sora lose their usefulness. Xion’s appearance is unstable and changes depending on who’s looking at her. However, she resembles Kairi nearly all the time in the audience’s perspective. The given reason is that she embodies some of Sora’s memories, and since the strongest memory was of Kairi at the time, Xion takes Kairi’s form. That means technically, she is neither female nor male–I know, it’s a weird concept to behold. So why is it that Xion had to be designed the way she was? Being a replica, she’s supposed to be more Roxas than Kairi anyways. Could Xion have worked out just as well had she been designed to be more of a boy? Francis: Yes, and no, I’d like to think. Of course we’ll never really get a chance to see ‘what could have been’ had Nomura designed Xion in the likeness of a male character, but I think Nomura’s intention to make her female may have had a lot to do with the fact that we seem enticed to picture the three of them (Axel, Roxas, Xion) as distant parallels of Riku, Sora and Kairi. 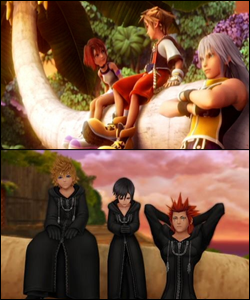 Cut-scenes like the one of the Nobody trio sitting on the slanted paopu tree is the most overt example suggesting this. Xion is perhaps one of Kingdom Hearts' most complex characters--and that's saying a lot when you're amongst the likes of Roxas, Ventus, and Namine. Is she ultimately a stereotype of the Japanese idea of women or is she an androgynous placeholder for the viewer? Either way, her role is more about connections than action. Xion, the Japanese Model of Women? Francis: Given the purpose and execution of Xion’s character in the lore, it’s also much easier for her to be female when we consider how Japanese culture illuminates its perceived strength of the female spirit. Xion’s most notable characteristic is how much of her existence is based on how she is connected to others. While it’s true that her appearance is completely dependent on the viewer, thus never making her conclusively one gender or the other, the fact that she is effectively the embodiment of many personae only further emphasizes how she allegorizes bonds and connections between individuals. As far back as the Nordic Bronze Age, history has continually posited women to value relationships and that the bonds they share are their greatest sources of strength. There continues to be much evidence of this even in Germanic culture during the Early Middle Ages, when women were commonly referenced as ‘peace-weavers’, often representing characters in fictional lore who successfully quell fights between men by calming them down with words. Contemporary social institutions today have preserved this notion, much of which we see most strongly in observational studies involving grade school children, noting significant differences in how boys and girls handle disputes among people of their own gender. As observed, the boys (as you can imagine) had a greater tendency to use physical violence while the girls preferred to strike at each other’s relationships. Withholding invitations to an important party or turning friends against one another–these are but staple examples; when aiming to injure, one always goes for where they believe they will inflict the most harm. Xion is a beautifully poetic representation of this age-old construct of female hegemony. Of course, it is impossible to tell which of the two Nomura came up with first, her gender or her personality, but based on what we know and see, these inferences are much more likely, in my opinion. Shay: I don’t really think it’s fair to use Xion as an example in this factor. Xion hardly talks with anyone but Roxas and Axel, and they both perceive her as a Kairi-like figure (whom she is meant to embody, via Sora’s memories…). She doesn’t really have her own personality (in my opinion), so it’s pretty hard to use her as a figure of study for the gender roles. Besides this, we don’t know the entire philosophy behind her either–isn’t it possible that her personality is different to Xigbar, who is seeing her as Ven from 358/2 Days, while being a game I completely loved, didn’t leave room for very much characterization and I’d say it’s safe to assume that the Kingdom Hearts Team didn’t go as far as they should have in developing her. She was an odd entity that died before reaching her full potential. If anything, I categorize her as being androgynous. Especially since the story is told from Roxas’ point of view, and he is also very closely related to Sora–things are pretty biased. Shay: I think Namine would be a much better candidate for this, since we can at least (with factual evidence, in-game) attribute her with a female version of Ventus. Since it was from, in a matter of physicality, his heart that Namine and Roxas would resemble you can look at some of his characteristics in a feminine way. Ventus expresses guilt and doubt at times (especially at the end of Birth by Sleep), which are characteristics that you don’t see at all in Kairi or Sora. It’s odd that Roxas and Namine expressed as much guilt as they did, I think, and it all could be blamed entirely on the heart that was responsible. Xion and Namine have very similar personalities. Both characters could be said to owe a lot of their characteristic sadness to Ventus, whose heart was alongisde Sora's when they were created. Francis: On the contrary, Shay, I think that’s an entirely good reason for her to be included in this discussion. While her character is (in effect) genderless, why is it then that practically all media sources, including Square Enix, regard Xion more prominently as a female, if the truth is ‘she’’s supposed to be neither? What Xion really is, and how she was consequently perceived by audiences gives great precedent for her inclusion in this discussion about gender. You, yourself, keep referring to her as ‘she’ and ‘her,’ meaning you are also satisfied with identifying her as a female, regardless of whether that’s how you really feel about it. If Square Enix really felt it was important for Xion to be known as someone absent of gender, it would’ve been very easy to do so, but they chose not to. By affirming her as a female, it is inevitable then that Square Enix’s development choices for her character revolve around a social schematic framework of what Square Enix constitutes as being female. Shay: Well, Francis, the audience identifies her as female because Roxas (and, consequently, Sora) do. Since they are the main characters, the audience sees things predominately from their point of view. But it’s one of those things that makes a lot more sense in retrospect and would potentially give people a reason to replay it. And oddly, they seem to stop doing it around the time where Axel mentions that he’s started seeing her as Naminé in his diary entry and instead they then skip to other characters like Saïx who always sees her as a robe no matter what. Francis: Exactly the case. We, the audience, can only perceive what we are given. If Square Enix truly thought it was important to distinguish Xion as genderless, they would’ve made the effort to emphasize this distinction, but as we can see from official character profiles, this is not the case. The fact that Square Enix chose to use Roxas/Sora’s perspective to posit Xion as a girl means they thought a girl’s representation (whatever that may mean to them) is the most appropriate way to deal with Xion’s character, and her subsequent role in the mythos. 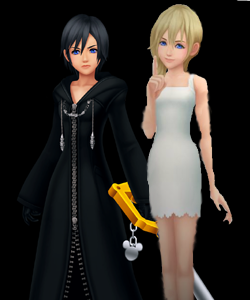 The point here is that Square Enix made a conscious design choice to make Xion most identifiable as a female, and that to me, is significant. Jackie: Like Shay said, it’s too bad the development team didn’t go further to draw out Xion’s character. Part of the problem was that 358/2 Days was devoted to learning about Roxas’ time in the Organization and Xion played more as a supplement to Roxas’ experience. She’s a blank slate until a number of hours in the game. In fact, Xion reminds me more of Roxas rather than Naminé or Kairi. Shay said that Naminé is very similar to Roxas, but I believe that Xion bears more parallel characteristics to Roxas. You can partly explain that by circumstance: Xion also has issues of memory loss (or rather, the lack of memories to call her own), and in a state of trying to discover her identity, she panics, runs from the Organization and rages. Not that it’s an unacceptable response, but it’s oddly reminiscent of Roxas’ time in Kingdom Hearts II. It’s almost as if that is the intended purpose of Xion–to act as a mirror for what will become a part of Roxas. I guess then, I would consider Xion to be androgynous. While I also agree with Francis in the distant allegory towards the Sora-Kairi-Riku circle as well as her role in strengthening bonds between people, I think that’s an artifact of the plot more so than it is a way to see Xion’s personality. I wonder if that is a message to players: that boys and girls are more alike than they think they are. Or when they’re young, they are, anyways. Whether or not that was their intention, it remains a pretty good message. Regardless, these characters are surprisingly more complex than the original main cast. 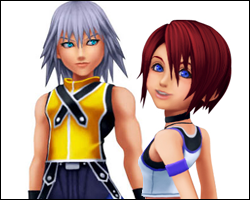 Kairi, Sora and Riku are actually quite easy to grasp in comparison–they’re clearly distinct. The short-lived three-way love triangle must have helped in defining them. Trinities definitely play a special role in Kingdom Hearts. There's no denying that Nomura has drawn parallels between the trio from the original game and the trios in 358/2 Days and Birth by Sleep. Hannah: Which begs the question–why have this setup as a trio parallel to the original main characters? I wonder, why do the trios have to be two boys and not two girls? They could have been chosen purely on the whim of Nomura, but they could also be said to appeal to female gamers perhaps? It is not ridiculous to suggest that female gamers may have been a large section of the target audience, as Disney holds a great appeal to many girls and may have persuaded them to pick up the game on that draw. Then to keep them interested and involved in the series, add two pretty boys for girls to fawn over? Always two guys. Even the Twilight Town trio (minus Roxas) consisted of two guys and one girl. Although I guess Pence isn’t that pretty. Francis: The two-man-one-woman scenario has been extremely popular in the media for several reasons, but its usage here in Kingdom Hearts seems to work to its own benefit specifically when we consider the demographic the game was aimed toward. Like many other elements in the Kingdom Hearts franchise, having two guys and one girl is a setup that works well for both children of younger ages as well as older teenagers (and even many young adults). It’s no mystery that most young boys would rather play as a male, and identify much better with video games that put male personalities in starring roles. Statistically, for these younger boys, their best influences and models on what is ‘cool’ and what is ‘interesting’ come from other boys. Girl things are considered separate, things they shouldn’t ever investigate, and thus girls themselves ‘couldn’t possibly be an interesting character to play as in a video game.’ But more important to this formula is the usage of two boys instead of one. One boy will guarantee identification. Two introduces diversity and competition. How many forum threads back in 2001 did you see entitled “Sora vs Riku: Who is better?” In individualistic cultures like ours, it’s empowering to be part of a ‘group’ that identifies itself uniquely from another. Some might say having a divergence in the fanbase regarding the ‘Sora vs Riku’ is detrimental, but they fail to realize that this split is irrelevant to the fact that the fanbase as a whole is still a fan of Kingdom Hearts, not to mention that the topic itself promotes liveliness and active discussion within the demographic. Similarly, two-guys-one-girl works for the female tweens as well, for reasons that more recent works like Twilight have so painfully demonstrated. ‘Sora vs Riku: Who is better’ still applies, but for completely different reasons–and ones that I’m pretty sure I don’t need to go into any considerable depth about. But from this we see how such a structure in a main cast consisting of three people is beneficial in several ways at once. Sora vs. Riku. The two friends have had a competitive relationship from the very beginning. Isn't that what usually happens in the two guys-one girl dynamic? Where's Kairi the peacekeeper when you need her? Jackie: There is definitely consistency in this triad pattern (I add Roxas-Axel-Xion to the list as well), although I’m sure the setup of the Twilight Town gang and the 358/2 Days gang stem from the original two-boys-one-girl setup for continuancy’s sake. There’s a dynamic with that sort of relationship that you can’t have with two people, or even two girls-one boy (that would be awkward). Also, I don’t think the setup was intentionally constructed to foster a relationship with the female players. 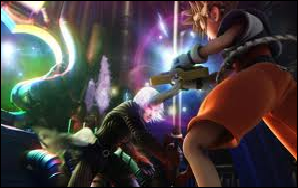 In fact, I think Sora and Riku did a much better job than that, especially Riku–he’s huge female fan fodder. Plotline aside, I suppose Kingdom Hearts could have gone with just a male-male rivalry, with something trivial to fight about (to be number one!) that is unrelated to being star-struck by a girl, but where’s the fun in that? Plus, Kairi is a fair medium between the two ends of the boys’ personality spectrum. It’s an instance where you have a character who’s actually non-stereotypical who makes the rest of the cast seem more grounded. This works well when you think about Olette compared to the other goofs, Hayner and Pence. Francis: Oh definitely. Having that ‘third wheel’ in a rivalry between boys always seems to work as long as it’s a girl (haha). In one capacity or another, they always seem to end up acting as a voice of reason, the one trying to make sure everyone is on the right page and together (an echo from an earlier statement I made about peace-weavers in Germanic culture?). Hmm, peace-weavers is a little dated, but these days I suppose we tend to coin this construct as the ‘maternal instinct’ of the female form? Olette is a much more obvious example of this, but Kairi is also equally relevant. Jackie: How about moving on to a final question that is only superficially related to our discussion and is only ever thought of and never uttered out loud? Riku and Kairi, That-Which-Shall-Not-Be-Named! Sure, we like to all pretend it never existed, but didn't Riku once have feelings for Kairi? Or was that just a joke at Sora's expense? Riku X Kairi. Why was that a possibility in the game? It’s unknown exactly how far Riku would have gone with his pursuit of keeping Kairi away from Sora because he eventually snapped out of the control of darkness, but I get the feeling that his actions with the Paopu fruit and all were more by-products of his competition with Sora rather than having truly deep feelings for Kairi. Shay: I think he had feelings for Kairi. He shows as much when he says “take care of her,” and the entire game he spent trying to save her. However, I think he knew that his feelings weren’t as strong as Sora’s–and I think he also felt a little unworthy of it, because Sora spent the entire first game using only the power of light and a lot of other respectable causes to save her, while Riku used dirty methods. I think a lot of his joking around about it was spurred by the competition, though. Riku’s the most mature; I think he was more able to see his emotions for what they were and alternately see Sora’s for what they were. He also cares about Sora a great deal, and albeit not romantically, they are not very far behind his feelings for Kairi–or maybe they are stronger, even. He doesn’t want to see Sora not get the girl, you know? Jackie: Thanks for the insight, Shay. With that, this month’s Roundtable draws to a close. Thank you Shay, Hannah, DizuniinoMahou, and Francis for giving us a lot to chew about regarding gender perception. I really enjoyed it and I hope our readers are able to take some thoughts home with them too! So what did you feel about our Roundtable Discussion? Did you agree with anyone’s thoughts here? Disagree? Anything that wasn’t said that you were thinking of? Did you enjoy the discussion? Are you looking forward to the next roundtable? Let us know–what you think matters!